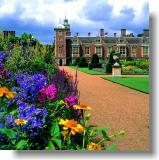 Blickling is one of the greatest houses in East Anglia. The house dates from the early 17th century and has fine collections of furniture, pictures and tapestries. Highlights which visitors can view include the spectacular Jacobean plaster ceiling in the Long Gallery and the distinguished library of 12,000 books. 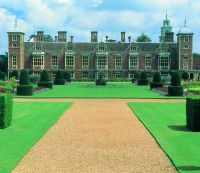 On most house open days there are 'Taster tours' at 12 noon.There is an exhibiton on the RAF at Blickling in the Harness Room and galleries in the East Wing and the Estate Barn. Delightful gardens and parkland surround the house with many good walks, ranging from a short stroll around the lake to longer rambles, including woodland routes through the 4,777 acre estate. There is a formal woodland wilderness garden with daffodils, bluebells, azaleas and rhododendrons, a secret garden, a dry moat with scented plants and a Victorian parterre garden with herbaceous borders. 1½ miles North West of Aylsham on B1354, 15 ml North of Norwich. Signposted off A140 Cromer Rd.